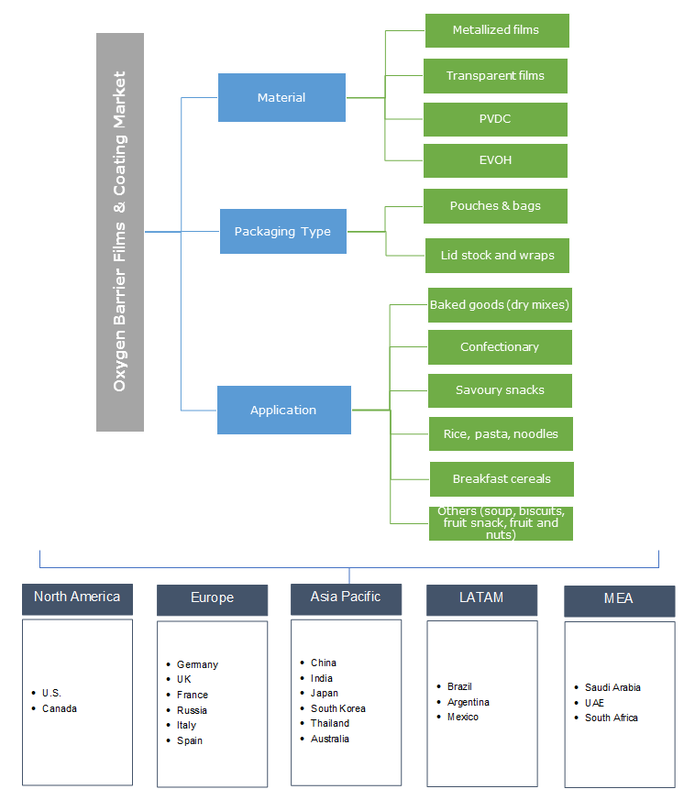 Global Oxygen Barrier Films & Coatings For Dry Food Market size was worth over USD 950 million in 2018 and will witness over 5% CAGR up to 2025. Shifting consumer preference for packaged food due to changing eating habits has promulgated the requirement for advanced material packaging. The necessity to maintain product sustainability and safety along with consistent attempts to improve packaging functionality are among the major factors fuelling the oxygen barrier films & coatings for dry food market. The overall packaged food industry registered over USD 2.6 trillion spending in 2016. Resistance against moisture, air, and gases not only improves the product shelf life but also helps in maintaining the taste and texture, thus influencing the packaged food demand. Less wastage and spoilage along with economical costing with respect to lightweights are key factors influencing demand in this segment. As per FAO, global food losses and wastage amount to USD 650 billion in developed countries and over USD 300 billion in developing countries annually. Food companies are expected to adopt new packaging materials to reduce food losses during transportation & reduce the overall environmental impact. Factors such as technological development, regulations, and changeable consumer buying behavior are expecetd to drive advanced packaging materials demand. The barrier performance of any packaging material is measured by its water vapor transmission rate and oxygen transmission rate. Food industry globalization in terms of exportation and importation has positively induced the oxygen barrier films & coatings for dry food market to meet certain requirements while getting transported within or outside the country boundaries. Enhanced packaging solutions to provide convenience to the consumers has resulted in innovative product development. Increasing popularity of moisture resistant pouches, bags, lid stock, and wraps likley to support industry expansion. Food companies are more focused on achieving the point of dfference by providing more convenient and attractive packaging to the customers. Government acceptance towards the inclusion of different films & coatings material such as PET, PA, and EVOH in packaging has positively stimulated the business growth. Convenience in carrying and stocking, ease in disposability, cost advantage in comparison to rigid packaging solutions are key identified benefits to drive industry growth. However, regulatory compliances regarding material recyclability may limit the business growth. Metallized films dominated the overall material demand and accounted for over 35% of the industry share in 2018. Glossy appearance, light weightiness, and strong resistance against moisture are among the key factors fuelling this segment growth. The material is highly preferable for decorative purpose due to its resemblance to an aluminium foil. The controlled permeation ability of metallized film results in extended product shelf life, thus driving metallized films demand across packaging industry. Transparent films are set to observe the highest gains in the industry and surpass USD 300 million revenue by 2025. Superior functionality regarding moisture and vapor resistance along with providing visual appearance to customers in order to compare the product makes the material popular in the food industry. EVOH is an effective oxygen barrier coating for dry food and gaining industry share from PVDC owing to its environmentally friendly characteristics. The material has excellent thermal stability and highly preferred for items which need superior protection from aroma loss. Pouches & bags accounted for more than 60% of the industry share in 2018. High applications scope owing to its better suitability regarding convenience in carrying and storage has positively driven the demand in this segment. Features such as stand upright ability, saving sterilization time, and easy handling over traditional packaging induced the product penetration. In addition, improved taste & nutrition preservation accompanied by enhanced shelf appearance makes this packaging type more popular in the industry. Lid stocks and wraps are gaining high attention in the recent years due to their space saving and seen through visual appearance benefits in the food industry. The segment will observe over 4.5% CAGR up to 2025. Key features such as integral anti-mist packaging to retain the taste and aroma will stimulate the demand. Baked goods i.e. dry mixes dominated the application share and foreseen to be worth over USD 500 million by 2025. Rising consumer spending on bakery products owing to change in lifestyle and eating habits has induced the high-performance packaging requirement for these products. Need to maintain product freshness, protein content, and improve shelf life are key reasons to witness high demand in this segment. Savoury snacks are the second fastest growing application and accounted for approximately 15% of the industry share in 2018. High spending on indulgence snacks along with the need to maintain product crispiness has promulgated the oxygen barrier films & coatings for dry food market. The other applications type includes soup, biscuits, nuts, and fruit snack and anticipated to gain notable growth over the projected timeframe. Asia Pacific is set to witness the highest gains and expected to generate more than USD 350 million revenue by 2025. With an urbanizing population and higher disposable income, large number of customers are expected to purchase packaged products in the region. In addition, availability of the same products in different sizes to suit the requirement of various customer groups has positively influenced the demand for oxygen barrier films & coatings for dry food. 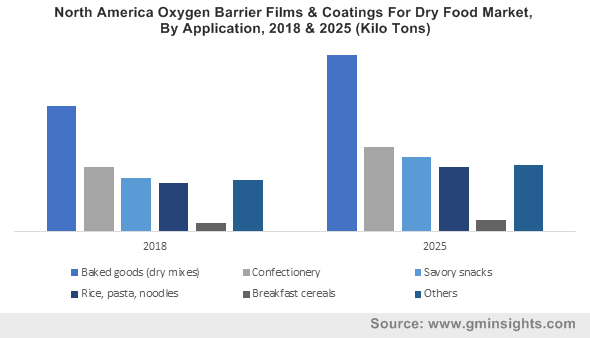 North America oxygen barrier films & coatings for dry food market accounted for approximately 25% of the overall industry share in 2018. Favorable environmental regulations along with a high preference for convenient packaging solutions will facilitate the regional industry growth. Strong presence of key manufacturers and well-established distribution network likely to support regional growth. The global oxygen barrier films & coatings for dry food market share is competitive in nature. Key industry players include Amcor, Bemis, American Pouch, Dupont Teijin Films, and Honeywell. R&D initiatives to produce enhanced quality products and innovations regarding transparent lamination will drive the industry share. Packaging process automation, product portfolio expansion, collaborations, and long-term supply agreements are key strategies adopted by the industry players. North America and Europe are the mature market and are saturated in terms of growth. Distribution channel expansion and R&D expenditure for better product innovation are among the key strategic initiatives taken by the firms operating in these regions. Regulatory bodies are expected to promote and develop innovative packaging solutions to reduce food waste generation. Oxygen barrier films & coatings for dry food is defined as a packaging process where the product is sealed with a high resistant packaging film to protect the product from outside contact of moisture, and gas. Increased shelf life and preservation of flavour and aroma are major benefits can be attained from this packaging. In terms of material, metallized are designed to preserve products from humidity and oxygen. It also helps in extending the shelf life of sensitive products through its barrier against water vapor. These packagings are also preferred due to their attractive metallic appearance and reduced weight. Transparent films are preferred due to its attractive visual appearance and more appealing to the customer. These are suitable for any lamination type and can also be printed with vinyl and PU based printing inks. PVDC (Polyvinylidene chloride) is a synthetic thermoplastic produced from vinylidene chloride polymerization. It is a see-through lamination used in packaging of food, cosmetics, and drugs. EVOH exhibit superior thermal stability and is mainly utilized in the packaging of perishable and nonperishable items due to its moisture resistance properties.